Blog Cause or Effect? Are You the Ball, Or the Person Playing The Pin Ball Machine? Cause or Effect? 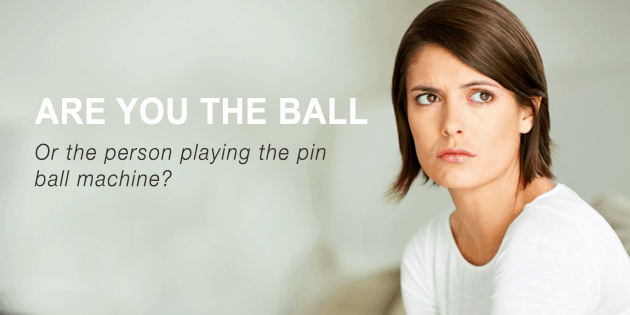 Are You the Ball, Or the Person Playing The Pin Ball Machine? Life is like a pinball machine. You’re involved in one of two ways. In life you can be at cause – you create your own reality and you look for the (sometimes subtle and sometimes not so subtle) ways that you cause that reality. You can also be at effect. In the pinball game, if you’re the ball, then life is something that happens to you. You are constantly getting belted around in the game. And yes – life is a game. There are lots of games you can play – business owner, mum, politician, rock star… I can keep going. If you take the position of being an observer and, more importantly, use your intention to be the person standing in front of the game and pressing the buttons, then you develop your ability to play the game. It doesn’t mean you’re going to be a successful business person straight away. The best position is to observe and watch how the game is being played. You’ll soon work out which button to press and when in order to make the ball go where you want it to.